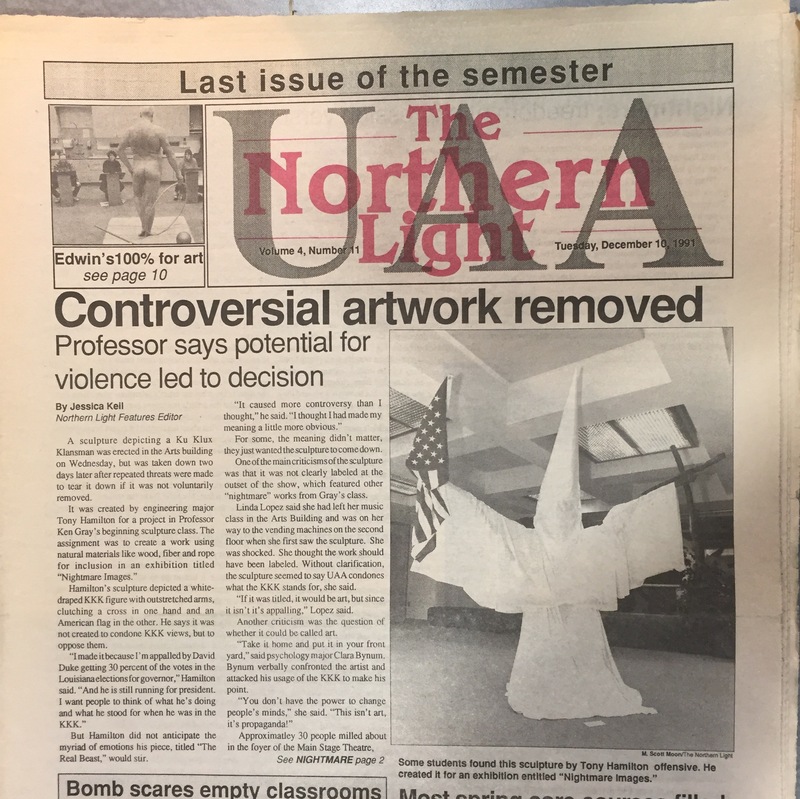 A sculpture depicting a Ku Klux Klansman was erected in the Arts building on Wednesday, but was taken down two days later after repeated threats were made to tear it down if it was not voluntarily removed. Hamilton’s sculpture depicted a white-draped KKK figure with outstretched arms, clutching a cross in one hand and an American flag in the other. He says it was not created to condone KKK views, but to oppose them. But Hamilton did not anticipate the myriad of emotions his piece, titled “The Real Beast,” would stir. For some, the meaning didn’t matter, they just wanted the sculpture to come down. One of the main criticisms of the sculpture was that it was not clearly labeled at the outset of the show, which featured other “nightmare” works from Gary’s class. Linda Lopez said she had left her music class in the Arts Building and was on her way to the vending machines on the second floor when she first saw the sculpture. She was shocked. She thought the work should have been labeled. Without clarification, the sculpture seemed to say UAA condones what the KKK stands for, she said. “If it was titled, it would be art, but since it isn’t it’s appalling,” Lopez said. Another criticism was the question of whether it could be called art. “Take it home and put it in your front yard,” said psychology major Clara Bynum. 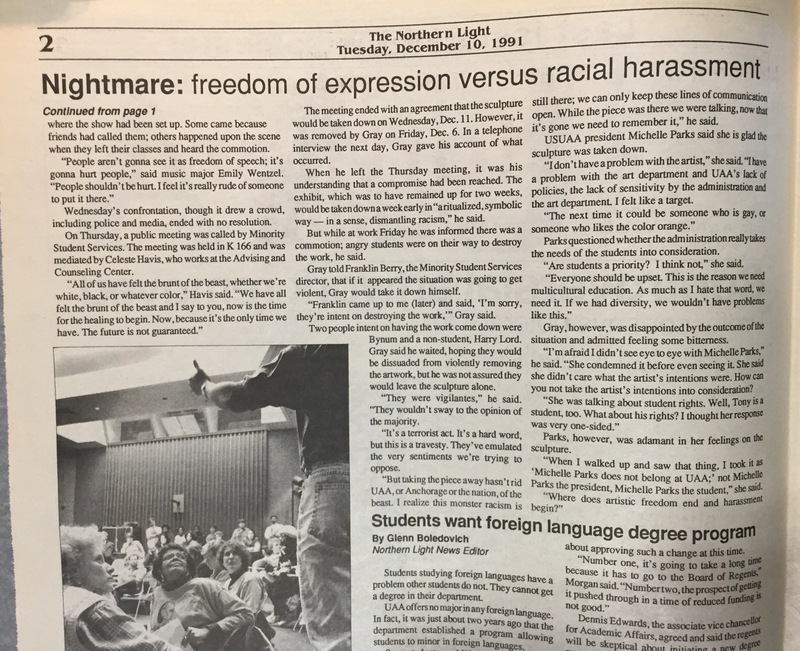 Bynum verbally confronted the artist and attacked his usage of the KKK to make his point. Approximately 30 people milled about in the foyer of the Main Stage Theatre, where the show had been set up. Some came because friends had called them; others happened upon the scene when they left their classes and heard the commotion. Wednesday’s confrontation, though it drew a crowd, including police and media, ended with no resolution. On Thursday, a public meeting was called by Minority Student Services. The meeting was held in K 166 and was mediated by Celeste Havis, who works at the Advising and Counseling Center. The meeting ended with an agreement that the sculpture would be taken down on Wednesday, Dec. 11. However, it was removed by Gray on Friday, Dec. 6. In a telephone interview the next day, Gray gave his account of what occurred. When he left the Thursday meeting, it was his understanding that a compromise had been reached. The exhibit, which was to have remained up for two weeks, would be taken down a week early in “a ritualized, symbolic way – in a sense, dismantling racism,” he said. But while at work Friday he was informed there was a commotion; angry students were on their way to destroy the work, he said. Gray told Franklin Berry, the Minority Student Services director, that if it appeared the situation was going to get violent, Gray would take it down himself. “Franklin came up to me (later) and said, “I’m sorry, they’re intent on destroying the work,” Gray said. Two people intent on having the work come down were Bynum and a non-student, Harry Lord. Gray said he waited, hoping they would be dissuaded from violently removing the artwork, but he was not assured they would leave the sculpture alone. “They weren’t vigilantes,” he sad. “They wouldn’t sway to the opinion of the majority. “It’s a terrorist act. It’s a hard word, but this is a travesty. They’ve emulated the very sentiments we’re trying to oppose. “But taking the piece away hasn’t rid UAA, or Anchorage or the nation, of the beast. I realize this monster racism is still there; we can only keep these lines of communication open. Whiel the piece was there, we were talking, now it’s gone we need to remember it,” he said. USUAA president Michelle Parks said she is glad the sculpture was taken down. “I don’t have a problem with the artist,” she said. “I have a problem with the art department and UAA’s lack of policies, the lack of sensitivity by the administration and the art department. I felt like a target. Parks questioned whether the administration really takes the needs of the students into consideration. “Are students a priority? I think not,” she said. Gray, however, was disappointed by the outcome of the situation and admitted feeling some bitterness. “I’m afraid I didn’t see eye to eye with Michelle Parks,” he said. “She condemned it before even seeing it. She said she didn’t care what the artist’s intentions were. How can you not take the artist’s intentions into consideration? Parks, however, was adamant in her feelings on the sculpture. When I walked up and saw that thing, I took it as ‘Michelle Parks does not belong at UAA;’ not Michelle Parks the president, Michelle Parks the student,” she said. Jessica is a writer, raised in Alaska, currently residing in Brooklyn, New York. She writes a lot about death and cats, she writes about books, she writes about dolls and other interesting things. Won’t you ask her to write for you? My Writings: Let Me Show You Them.